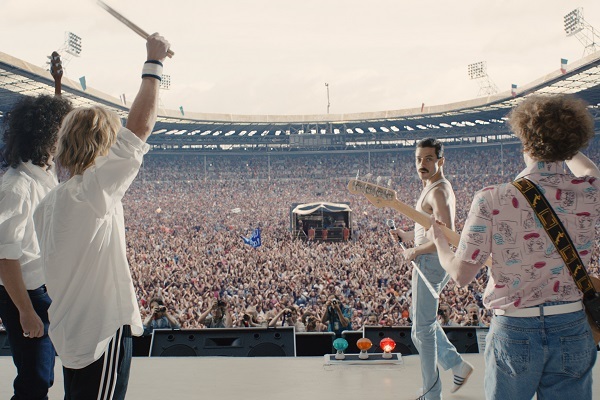 The much-anticipated Queen biopic “Bohemian Rhapsody,” starring Rami Malek as late frontman Freddie Mercury, opens in U.S. theaters today (Nov. 2). Speaking with The New Yorker, Malek discussed a prop that’s getting some attention: fake teeth that were created to look like Mercury’s overbite. Malek added that preparation for the role involved producers sending him to London, where he took singing and piano lessons and studied Mercury’s mannerisms with a movement coach and dialect coach. Malek also watched videos of Mercury for four hours every day to understand his mannerisms. “We would just sit there and watch him in an interview, and see when he moves in and out, and blinks, and covers his teeth,” he said. In other news, a new book called “Long Live Queen: Rock Royalty Discuss Freddie, Brian, John & Roger” is out featuring interviews with a a bevy of high-profile musicians, who talk about Queen and how the band’s music influenced them. Among the musicians featured in the book are Def Leppard’s Joe Elliott, Kiss’ Paul Stanley, Todd Rundgren, Genesis’ Steve Hackett, Judas Priest’s Rob Halford and K.K. Downing, Yes’ Geoff Downes, Yoko Ono, the Smashing Pumpkins’ Billy Corgan, Soundgarden’s Kim Thayil and Twisted Sister’s Dee Snider. The musicians talk about what they love about the band, their memories of being at Queen shows, meeting the band’s members and favorite Queen songs and albums. Rock journalist Greg Prato penned the book, which is out now in paperback and as a download via Kindle.